Flash memory stores data in a series of semi-conductor memory chips. In simple terms, the movement of electrons in tiny transistor circuits determines whether the digital bit is a 1 or 0 and a series of these integrated together make up the digital code for the stored information. Flash memory can be either non-volatile (NAND) or volatile (SDRAM). Non volatile memory means that the data stored on the device is retained even though no power is flowing to the device. This is the same situation as hard disk drive storage. On the other hand, volatile memory requires current or power to flow in order to maintain the storage of data. 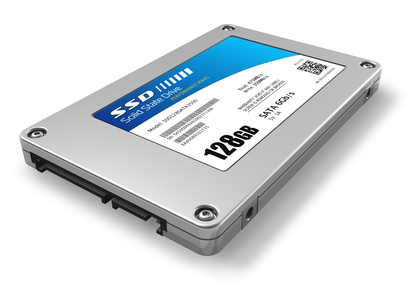 SSDs use the same interface as hard disk drives (HDDs) and therefore, can replace disk drives in many situations. However, there are some major differences between solid state hard drives and traditional hard drives. Traditional hard drives are mechanical devices. One or several rigid platters, a spindle motor, read heads on moveable arms, and other mechanical parts, are placed inside a sealed case. The sealed case is required to prevent contaminants from reaching the disk surfaces which would lead to head crashes and drive failure. The case, disks, and other parts collectively are known as a hard drive. The fact that the hard disk drive has all those moving parts is a major weakness in this type of storage medium. In fact, most of the hard drive failures that occur are due to the failure of the mechanical parts, rather than disk degradation or disk damage. These parts fail because of wear and tear or shock from shaking, dropping, or banging of the disk drive or computer housing the drive. This is why in many situations, data can be recovered from a failed hard drive by repairing the damaged mechanical parts. This should only be performed by professionals under clean room conditions. A solid state disk drive does not have spinning disks or moving mechanical parts but simply a series of semi-conductor memory chips in a case. Therefore, this type of storage is very durable. Hard disk drives consist of spinning disks and although they spin at a fast rate, there are still times where speed can be an issue, such as when the disks need to spin up. Also, because data gets fragmented when stored, a hard disk that is not periodically defragmented can suffer considerably in speed performance. With no spinning disk platters, solid state hard drives are very fast with an almost instantaneous response. Fragmented data does not slow the reading speed and defragmentation does not lead to increased performance. Random access time is much quicker for SSDs than HDDs. For hard disk drives, the size of the drive case is determined by the hard disk platter size. The platter sizes can vary from 5.25 inches to 1.8 inches. With solid state hard drives, any size or shape is possible because there are no disks, just memory chips. In many applications, the same form factors as hard disk drives are used for good compatibility with existing systems. In 2010, storage on SSDs is about ten times more expensive than on HDDs. Although cost per GB for both types of storage media does improve every year, it is falling faster for solid stage drives. Solid state drives have no moving parts and are therefore quiet. Hard disk drives do have various moving components and there are varying amounts of sound emanating from the drives when they are being used. Strong magnetic fields up close to a hard disk drive will affect the data on HDDs but not SSDs. Flash hard drives are lighter than traditional hard drives. Flash solid state drives have a limited number of rewrites, whereas hard disk drives do not. Traditional hard disk drives are available in higher capacities, but solid state disk drives are increasing in capacity every year. Solid state hard drives use less power than hard disk drives. Traditional hard disk drives have a long performance history. Solid state disk drives are comparatively new. With increase in use, reliability and longevity of this type of storage medium will hopefully be established. In the meantime, this type of storage medium should not be used for the long term storage of data.